Field Programmable Gate Arrays (FPGAs) are large-scale, runtime programmable logic devices which generally include hundreds of customizable I/O pins. These offer various voltage signaling standards, user-definable logic gates and latches, embedded RAM for Dual Port or FIFO functions, and fixed hardware functions such as optimized multipliers. 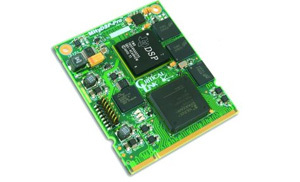 Critical Link’s MityDSP family of System on Modules (SOM) combine a Xilinx FPGA along with DSP and/or ARM. (For some boards, an FPGA is optional.) Slices, logic cells, and block RAM will vary from board to board, which are designed to meet a broad range of processing needs. 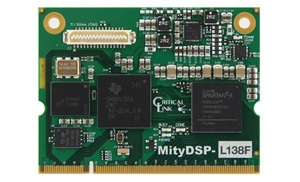 E.g., the MityDSP-6455F, Critical Link’s high-end DSP-FPGA SOM, utilizes the Xilinx Spartan 3 FPGA; the MityDSP-L138 Family combines DSP and ARM processors with an optional Xilinix Spartan-6 FPGA. While custom ASICs (Application Specific Integrated Circuit) are a good solution for high volume applications, tooling and pre-production costs prohibit their use in low to medium volume high-tech devices. Instead, these products often take advantage of an FPGA. These large scale integrated chips contain an array of logic gates, most commonly NAND gates, which can be “programmed” by the manufacturer to accomplish a series of specific logic functions. As the name suggests, the logic in the FPGA can be programmed in a fielded device, normally at system startup. This programming can be updated from time to time allowing convenient product maintenance. FPGA technology is the newest generation of what started in the 1970s as Programmable Read-Only Memory (PROMs) and Programmable Logic Devices (PLDs). The major difference is in easily allowing the equipment manufacturer to provide for in-circuit reprogramming of these devices instead of having to pre-program the devices at the factory. Some more advanced FPGAs have analog functions built-in to integrate with the digital functions. Common functions might include Analog to Digital Converters, Differential Comparators, and Programmable Slew Rates. These large-scale integration chips blur the line of separation between FPGAs, which are digital devices, and FPAAs (Field-Programmable Analog Arrays), which are clearly an analog device.